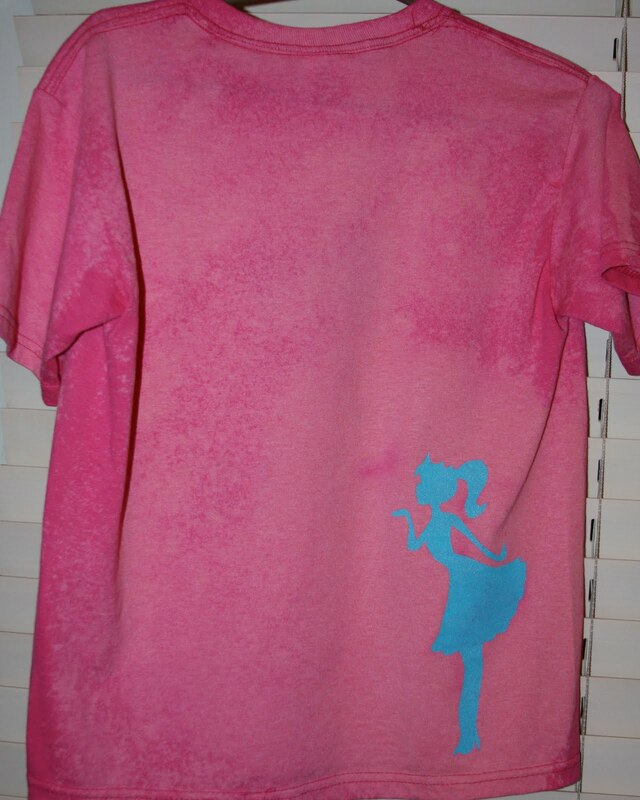 Jamie had a wonderful tutorial a few weeks ago about freezer paper stenciling. You can see it here. 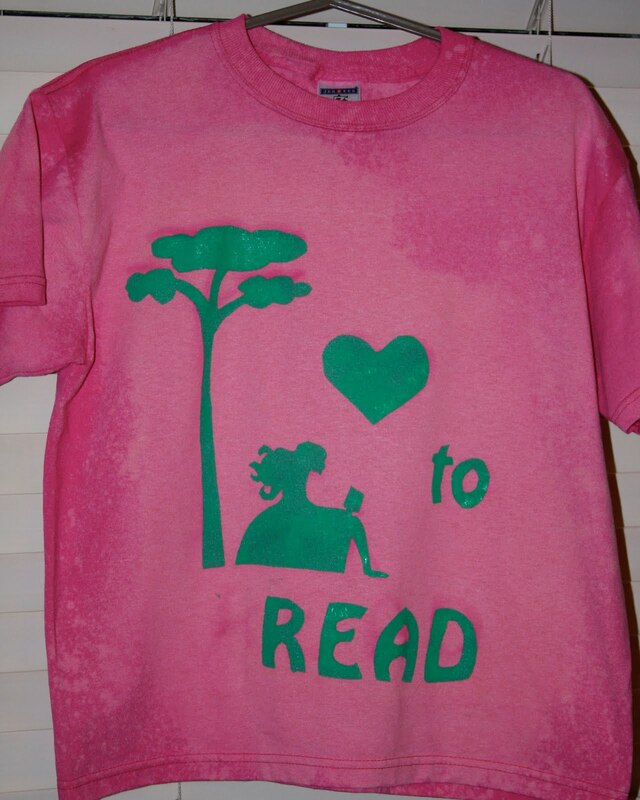 Well I took her tutorial and made some fun shirts for my kids. This was my first attempt at freezer paper stenciling. Thank you Jamie for making this so easy and fun. So here is what we did.... First I wrote down ideas of what each of my kids favorite things are. Then I searched online for clipart ( I am not the best artist ) that matched the ideas. Printed them out and traced them onto the freezer paper. I took a utility knife for the smaller areas that needed to be cut and then scissors for the rest. 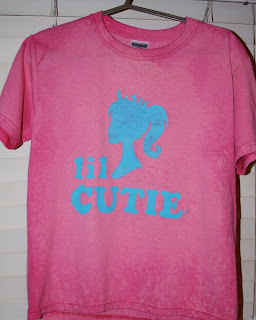 Before Ironing the Freezer Paper on, I had started with 3 pink shirts for the girls and 2 blue shirt for my son. I hung them up on hangers and took them outside and gave them a spray bleach bath. LOL That sounds weird. Let them dry and gave them a quick bath (as the kids would say) in the washer. Dried them and they were ready to go. I am glad I did that because it gave them a kind of unique look. Back to the Freezer Paper Fun.... we then ironed the freezer paper (shiny side down) to the shirts. Now comes the fun part of decorating with paints! We bought a sponge and cut it into a bunch of small pieces. These were our little paint sponges. I found some fabric paint on sale at JoAnn's. Grabbed a paper plate to squeeze the paint onto and started sponging away. Let the paint try and then just peel off your freezer paper. 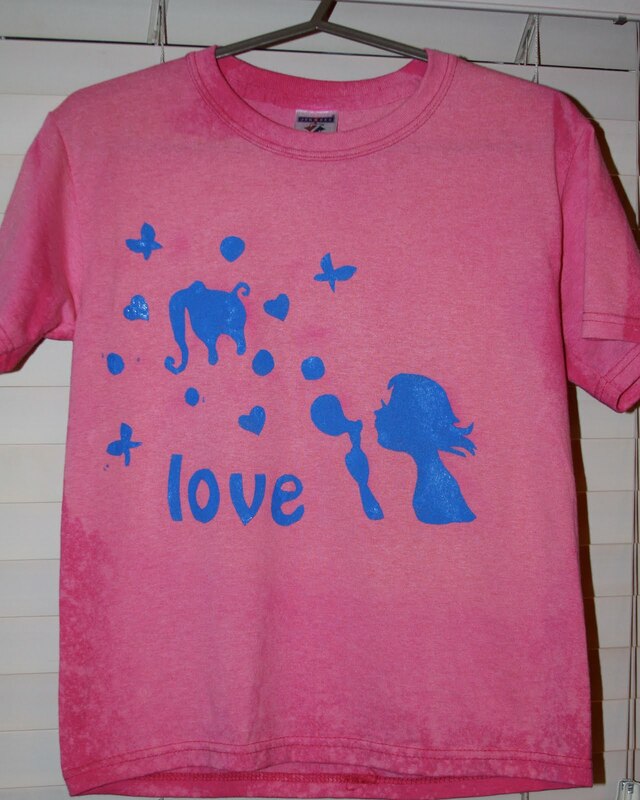 You can either do another quick wash (which I recommend) or let the kiddos try them on for a bit before the wash. You know, because they are going to be anxious to put on their favorite things shirt! My sons is pretty cool. 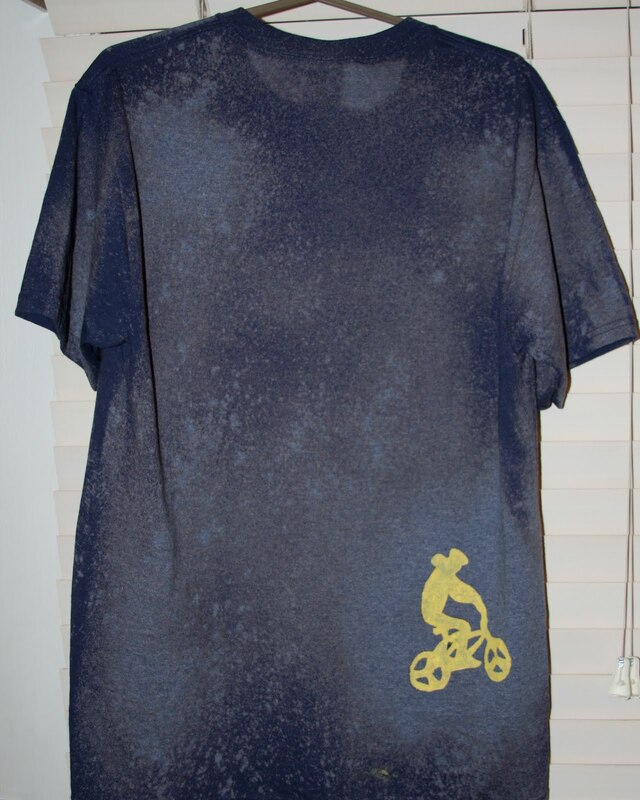 He has a bmx stunt shirt. It starts on the back of the shirt and then comes around to the front. 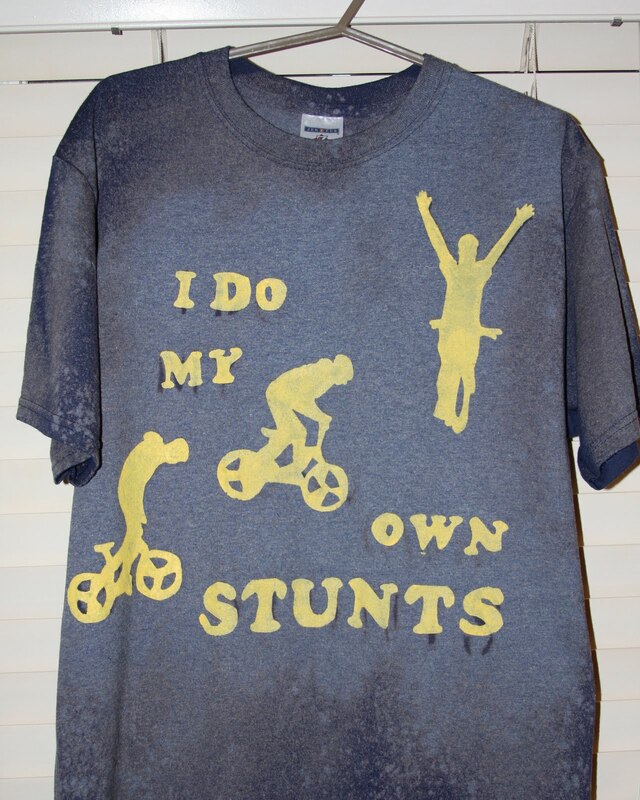 What's cool is the stunt stencil starts out riding then going up on the bike, back down again and finally the arms up in the air screaming "I DID IT" Well it doesn't say that, but I like to think it. LOL We loved the saying "I DO MY OWN STUNTS" So that had to go on there as well. He loves it. My oldest daughter is our reader. 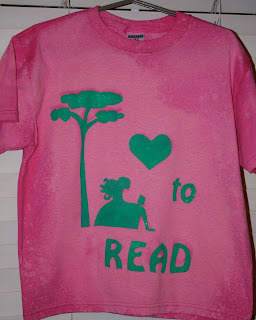 She loves to read anything and mommy is loving that she loves to read craft and sewing books. Hint! Hint! Someone to create with. So her shirt was easy. We found a tree and placed a girl reading under the tree. Then of course it had to say love (we made a heart as you can see) to READ. My middle daughter is our little bashful cutie. She loves to be a princess but is very sporty too. So she chose a princess wearing a crown with the saying "LIL CUTIE" princess was too long. Eeeeek. My favorite part of her shirt is the back. We added the same princess only larger and she is blowing a kiss with her high heals on. Too Cute. Last but not least my youngest daughter is in love with elephants so I had to use them someone. But I found this adorable image of a girl blowing bubbles and loved that too. So here is what we did.... we have the girl blowing bubbles and her imagination (wink) turns her bubbles into her favorite things. So we have the elephant, butterflies, hearts and bubbles. Added "LOVE" and we were done. These were so much fun to make with the kids. They thought they were the best because they were what they picked out, colors and all. I would love to see what you come up with. So please share. Hope you enjoyed our fun lil project. what a fun and creative idea. I am definitely going to do this with my son. Love the bleach effect. I have this on my list of DIYs to try but I keep forgetting I have so many. Thanks for posting and reminding me. Hey hun awesome tutorial. I am just stopping by to let you know I gave you a blog award. Looks awesome tara!! I've got some more in mind just have to make them happen. wish my kids could tell me what they want on their shirts..wait, no I don't....not yet, this is the only time I get to do what I want!! I'm saving this as my favourite... This will be my kiddies DIY for the summer... I'm sure she will be thrilled!! I so want to try this...I also saw a way to do 'mod podge screen printing'...but I don't know what the difference would be in the end result. Any ideas?